Welcome to the NST/Engineers' web site for engineering, HAZCOMM, HAZWOPER, training, Brownfields remediation, Safety & Health training, content and services pages. We are the authors of the 755 page book with companion CD, published by NST/Engineers, Inc., "Hazardous Waste Operations & Emergency Response Manual and Desk Reference", the first published book covering all of HAZWOPER and a wealth of related material. 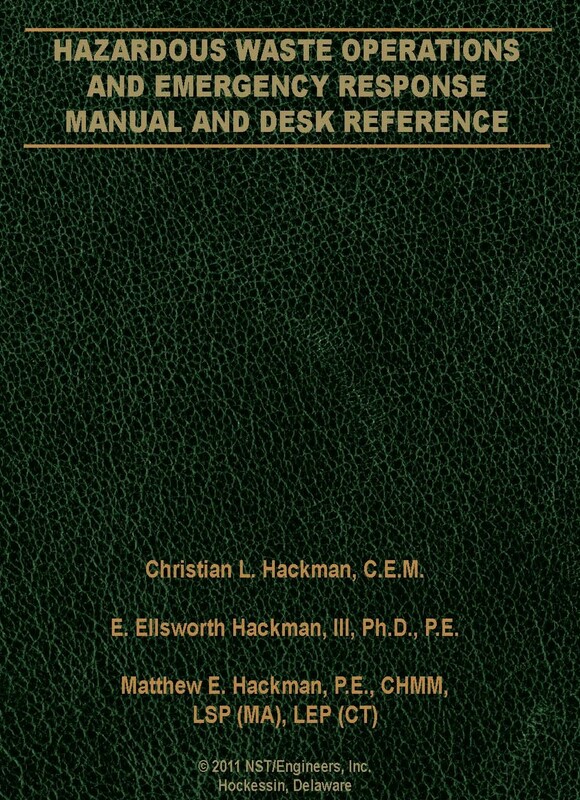 "Hazardous Waste Operations & Emergency Response Manual and Desk Reference" NST/Engineers, Inc. (2011), by Christian L. Hackman, E. Ellsworth Hackman, III, and Matthew E. Hackman. This seven hundred plus pages book comes with Companion CD loaded with HAZWOPER and HAZCOMM training materials, extensive references, hot links to web resources, containing essential guidance materials for First Responders, and much more. To purchase a copy or to see readers' reviews of "Hazardous Waste Operations & Emergency Response Manual and Desk Reference", just enter its ISBN number: 0071378812 in the Amazon.com keyword search box. Keep stopping by for our updates. Here's an example of the type of incidents reported and analyzed on our PHAs and PSM pages (see links at upper left of all first pages). In 2003 there was an explosion and fire at the CTA Acoustics plant in Corbin, KY. Combustible dust in the plant ignited according to investigators of the U.S. Chemical Safety and Hazard Investigation Board (CSB). The Feb. 20, 2003 incident took seven lives and caused over thirty injuries. An initial explosion and fire occurred on a production line that was partially shut down and being cleaned at the time of the incident. During the cleaning, a thick cloud of dust dispersed around the line. The dust was likely ignited by a fire that spread from the production line's oven, which was still operating, investigators said. "The plant's four production lines had a history of small fires erupting in the ovens," said lead investigator Bill Hoyle. "Plant operators routinely put out these fires. However, during the cleaning operation, no one was present in the immediate area of the oven who could have detected a fire." Note: Click on the colored links below, or the red or blue links on the top left side of pages, to go to other pages. For information on Liberty Mutual's exhaustive report on Workplace Injuries and their Costs, go to our World Class Training page. Need assistance on an engineering or environmental project? Need assistance with safety management? Our Process Safety Management (PSM) pages define process safety, provide incident reviews, and tell how to achieve a high level of accomplishment. Need assistance in identifying plant or process hazards? Our Process Hazard Analysis (PHA) pages provide content on industrial hazards, explosion and fire incident reviews, and analyses. Need help in training employees to meet OSHA requirements? Our World Class Training pages report the latest requirements for industrial safety and health training. Also HAZWOPER, HAZMAT, HAZCOMM, Forklift training, Bloodborne Pathogens, Egronomics, and other OSHA required safety training courses we offer. HAZWOPER training includes the 40 hour, 24 hour, and 8 hour Refresher courses. Planning to purchase real property? Or do you have property that might need, site remediation, and you need financial protection or cleanup? Our Environmental Site Assessment pages explain the background of, and the NST Engineers process for, this form of real estate pre-purchase evaluation. Case histories are included. Have a landfill exuding gases that are not being used? Our Landfill Gas pages describe a successful alternative energy project delivering power plant fuel. Want in-depth information about leading engineering and environmental references? Our Helpful Technical Books, CDs, and Videos Reviewed pages present reviews of books, CDs, and videos we have found that provide valuable insights, training, and reference information. Top publishers and providers include McGraw-Hill, Wiley, R.S.Means,and Palmer's Scaffold Training Institute, among others. You can use a powerful Amazon.com search engine for immediate answers and purchases on these pages. NST/Engineers makes use of a core staff having a combined industrial experience of over 100 years. The core staff performs the functions of project management, OSHA required safety training, cost estimating, scheduling, cost control, site supervision, and documentation. Their experience, and that of associates, is especially broad with respect to work in a wide range of services and training areas, industries, materials, and processes. Some services areas examples are: HAZWOPER, and more, safety training to satisfy OSHA requirements; process safety and site inspections for OSHA compliance; brownfields site investigations and remediation; remediation "Cost Cap" insurance project plans; waste treatment engineering; air pollution control designs, and plant equipment startup, operating, preventive maintenence, and safety instructions. Materials experience includes: surfactants and detergents; rayon; propellants; hazardous wastes, lead, asbestos; PCBs, pesticides, and other ‘refractory’ organics;industrial gases, hydrogen, helium, oxygen, nitrogen, and argon. Our process experience includes: absorption, adsorption, combustion, extraction, filtration, gas scrubbing, hazardous waste site remediation, oxidation, ozonation, polymerization, sulfonation, and spray drying. For a fee-based consultation call with a Licensed Professional Engineer between 3:00pm and 5:00pm Eastern Daylight Time, call (302) 239-2700. For information at any time on our Hazardous Waste Operations and Emergency Response (HAZWOPER) and other safety training, click here.